Katie Brenner is a West Country gal trying to make her London dreams come true. And failing spectacularly. She’s finally got a paying job as a research associate at a branding (Advertising) agency, but she’s the lowest one on the books there. Her salary is so low she shares a flat with two other people, more than an hour’s commute away from work. She admires her friends’ Instagram accounts, and fabricates her own “fab life” with pictures she grabs on the go–because she could never afford that decadent coffee, or that divine dinner spot. Nope. But, she studies hard, making lists of all the places she’s check out just as soon as she launches her way up the ladder to success. Her boss, Demeter, is a criminally scatterbrained woman with far too many fabulous aspects to be truly human. She’s always out to dinner, or at an award night, and her family is all shiny and perfect. And, if the office rumor mill can be trusted, Demeter’s got a long-standing “arrangement” with Alex, the younger partner in their firm–and the man Katie’d thought had a bit of an interest in herself. Katie, who calls herself “Cat” in her fab life, studies Demeter, aspiring to learn more and impress her one day soon. It’s not meant to be, however. Their branding firm is having some issues with clients and Katie’s let go soon after she designed the branding on her father’s newest get-rich-quick scheme: glamping on their country estate. Having no other prospects, Katie returns home from London under the premise that she’s got a ‘sabbatical’ to help out her family. Really, she can’t admit she had a horrible life in London, because her father’s totally against her living there, and she doesn’t want to live int he country forever. She’s making applications and chatting to headhunters whenever she isn’t setting up the glamping yurts, or customizing the “totally organic experience” for each of their hoity-toity guests. It’s with immediate dismay that Demeter and fam arrive–because she’ll blow Katie’s cover to her dad. Then again, when Demeter doesn’t recognize “Cat” in her ‘West Country Katie’ persona, Katie’s able to get some of her own back, torturing Demeter with “one-of-a-kind,” “exclusive,” “holistic” treatments. That is, until Katie grows a conscience, and learns that Demeter isn’t as nearly perfect as her Instagram feed would reflect. I really dug this one. It’s a more mature, and less-slapstick, type of book than I’ve read from Ms. Kinsella before. The careful plotting and copious breadcrumbs led me right into the conundrum: how do we cope when life isn’t like we spin it? Social media facades, cyberbullying, corporate espionage were not what I expected to find in this one, but, wow! Was this a rich tapestry. Katie’s a great character, not too young, despite her naivete, at points. She’s fully relatable, as the plucky gal clawing her way out of a hard-scrabble life–only to have her dreams dashed. The amazing turns of situation, particularly regarding Demeter and the jobs at their branding firm, was carefully intimated, and led me along in the proper directions. Plus, I got yet another object lesson in the value of empathy, and being a stand-up person even when it’s really freaking hard. Facing down her father, with his absolute love for Katie and desperate want to have her stay home forever? Appropriately heart-crushing. I loved Katie, and how she grew up and owned her life, and her mistakes. There’s a bit of cloak-and-dagger business as Katie tries to work herself back into the branding firm–on behalf of Demeter. I liked how there was so much uncertainty regarding Demeter’s mental state, and if she really was the horrible/insensitive boss she’d seemed at the beginning, or if this was the product of some illness. Or, worse. Alex’s role was definitely interesting, as he’s not-quite a hero. He’s a regular guy with work problems, too, which was rather enchanting. I love it when the characters are actual humans with everyday problems. The book is a bit long, but the read is easy and the pages turn themselves. I really hoped we’d see a bit of steam on the page, but alas, fade-to-black… *shrugs* Fans of the author won’t be disappointed. Interested? 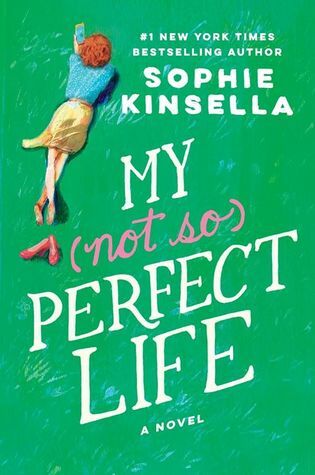 You can find MY NOT SO PERFECT LIFE on Goodreads, Amazon, Barnes & Noble, iTunes, and Kobo. It’s surely on sale at local bookstores, big-box retailers and likely already on the shelf at your library. I received a review copy via NetGalley.